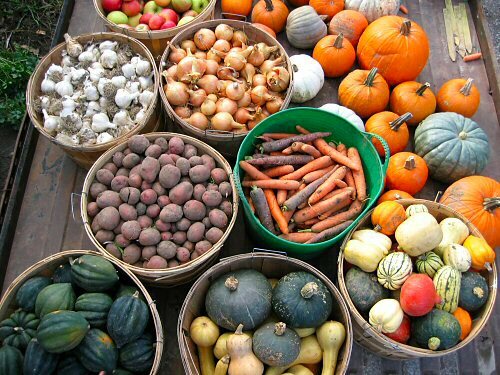 With the farmers’ market over, time to turn to fall-and-winter things. This year, I’m for the first time organizing a proper veggie selection for storage (it’s about time I started…training for that future CSA root cellar!). Instead of the usual bushel baskets of this and that, casually left around the barn to take their chances with temperature and location, now, there’s a bit of plan. For a root cellar, the basement of the farmhouse, the side with a dirt floor that used to be filled with potatoes when this was a fully working, big family farm. For the veggies, today’s haul has a mix of potatoes, assorted winter squash and pumpkins, various carrots, onions, garlic, plus apples picked up at the market. It’s a first step, there’s still lots more in the field: beets, spinach, collards and kale, herbs, and more carrots to go… Harvesting isn’t history just yet! Au revoir to the farmers’ market! Congratulations on making it to the end of the market season. It is an exciting time and now you are able to look around the farm and just think for a bit instead of “just do”. Yeah the seasonal nature of farming is one of the most rewarding aspects of it for me. Every time you are a little tired of a task: planting, harvesting greens, or preparing beds, it is time to move on to the next phase of the season. When the season ends there is some relief and some sadness, but it just feels right because it is the time of the year to slow down.